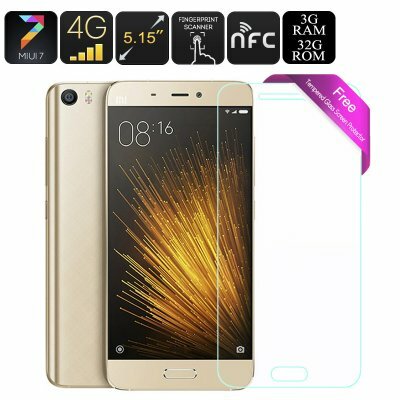 Successfully Added Xiaomi Mi5 Smartphone - Qualcomm Snapdragon 820, 3GB RAM, 5.15 Inch Screen, 4G, Dual SIM, 3000mAh Battery, 16MP Camera (Gold) to your Shopping Cart. Bringing all the tech you'd expect from a high end flagship Smartphone but at the price of a mid level phone the extraordinary Xiaomi mi 5 is an attractive buy for those wanting a top performance without breaking the bank as its over 20% cheaper than its closes competitor. It boasts a lightening quick performance due to the Qualcomm Snapdragon 820 CPU with 3GB of RAM and sees of most of its competitors when it comes to speed tests reaching over 100000 on AnTuTu tests. If you're into heavy phone usage, want to play the latest mobile games or demand more for your money then the Mi5 is a good bet to fulfill your needs. This elegant smartphone is easy on the eye with its metal and glass body the curved edges that meet seamlessly in a beautiful design that light and comfy to the touch. This surprisingly slim phone weighs just 129 grams yet packs in so much, like its 3000mAh battery. An unusually sized screen at 5.15 inches makes vieing a pleasure on this phone as it has superb brightness and color depth as well as a sharp clarity that makes the details pop. In fact at 428 pixels per inch full HD resolutions have hardly looked better. so whatever takes your fancy, its sure to look great on the Mi 5. You can take control of two SIM cards on the Mi 5 as and each of these can support 4G so there's no need to swap SIMS out when traveling away from home and organizing contacts couldn't be simpler. With the as MIUI V7 OS, Xiaomi's very own customized version of Android Marshmallow , you get an easy to navigate simply interface that offers something a little bit special than the regular android OSs you may be more familiar with.